COMMENTARY: “Follow the money.” It’s a tired cliche, but that doesn’t make it any less true in today’s world. And it couldn’t be truer in the multi-trillion-dollar worldwide obsession that is football. Even in “Lille Norge.” In fact, if you follow the money, the media circus around Ole Gunnar Solskjær’s “will-he, won’t-he” non-move to the English Premier League becomes all the easier to understand. It all started on Wednesday May 16. “It” being people following the money, of course. The odds on Ole Gunnar Solskjær becoming manager of English football club Aston Villa started to drop. And as they dropped, so came more and more money, and the virtuous cycle (for the bookmakers, at least) of falling odds leading to more money was set in motion. Somebody, probably on the inside at Villa, had heard something and taken a flutter; and then the cash started rolling in. As most Norwegians were buying in supplies for Constitution Day celebrations on the 17th of May, the world’s most famous Norwegian, Ole Gunnar Solskjær, was busy with far more glamorous business. The former Manchester United star came back to his first club, Molde, last year in a blaze of glory – the return of the local boy done good – winning Norway’s top league, Tippeligaen, at the first attempt. All eyes were on the “baby-faced assassin” – and not just in Norway. Rumours began to swirl that clubs in the holy grail of football, the English Premier League, was interested in the Norwegian legend. On the 16th of May, Villa was the first to go from interest to action. And they did it in the style that has come to define international football. Villa’s wealthy American owner, the frankly wonderfully named Randy Lerner, sent his own private jet to a small airport near Solskjær’s home in Norway to bring him to Birmingham, England, for talks about a possible move. Discreet it was not, even if it should have been, for as soon as the jet was on the Norwegian runway, pictures of the extravagant gesture started to circulate. There was no doubt who the plane was there to pick up, there was no disguising the fact that the local hero was flirting with foreign fanciers. The saga erupted into life. And talking is just what the fans began to do. They began to do the unthinkable and question their talisman’s intentions, actions and, ultimately, his loyalty. Leaving after one year to a bigger league? Surely not. Whispers began; first, simply questions of why, especially now at a crucial point in the Norwegian season, and soon those whispers became louder, and those questions even harsher in tone. Managers come and go in football, it is said, but wealthy backers must be held onto, and tight; is even this manager worth more than the club’s long-term paymaster? Solskjær was in a pickle, but learned quickly. The next day, the jet was ditched. Instead, he took a “normal” flight home with airline Norwegian, a gesture of patriotic self-restraint. And the learning didn’t end there. Over the coming week, he would have to show contrition, discretion and sensitivity. He had to navigate the perfect storm of Røkke’s fire, the supporters’ doubts, the players’ worries, his family’s feelings – not to mention the affections of his many fanciers in England – and do so at the same time as Molde faced two important league games. The undersigned can’t claim to be an impartial observer of this bizarre charade. I’m a diehard Aston Villa fan, but that’s just for starters. I also happen to live in Norway, and am a big fan of Solskjær and what he has achieved at Molde. Like the majority of Villa fans polled by a local newspaper in Birmingham, I wanted Solskjær to jump on that private jet again as soon as possible and fly straight into the vacant manager’s seat. I thought it was a given, and was just counting down the days. To say I’m disappointed is an understatement. But, as a long-suffering fan, I know, deep down, Villa is not the most attractive job offer to an ambitious young manager with Solskjær’s accumulated footballing capital. Villa was a big club once, but I’m not even sure I would want to manage them right now. Solskjær isn’t stupid; he isn’t going to trade in his enormous-fish-in-a-tiny-pond life in Norway for any old job in England. The move must be right. Even if he would earn much more money at Villa now than he does at Molde, he knows that a few more seasons of success in Norway could land him an even bigger pay check at a much bigger club a few years down the line. And, of course, if he could use the affair to leverage some more money to spend at Molde now, giving him a bigger chance to achieve that success, it would make the whole thing worth the effort. 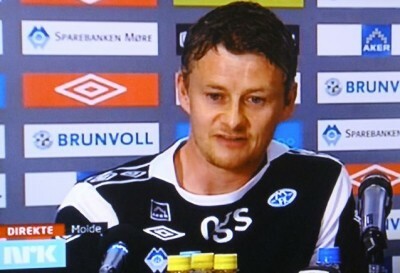 So Solskjær exchanged his baby-face for a poker-face, equivocating on questions of whether he would eventually accept an offer at Villa while make reassuring noises about still being Molde manager and wanting to sit face-to-face with Røkke. His media handling of the affair from the second day onwards was executed expertly in every way the first day was not. The tide of opinion turned his way. Røkke was cast as the villain, a shadowy figure who had thrown his toys out of the pram, at the same time casting aside his apparently beloved club just because someone had failed to answer his questions in a timely fashion. The businessman’s friends and biographies did their best, it seemed, to paint a picture of a ruthless entrepreneur who always held grudges. Solskjær, we were reminded, had never lied about his intentions to manage in England again. He had delivered Molde its first and only league title, and the club should be grateful. It was another example of the Scandinavian janteloven in practice – simply, jealously – to hold back a talented young man from his dreams. With the ball firmly back in his court, Solskjær executed the final play of the game brilliantly. There would be a meal, in Oslo, between Røkke, Solskjær, another wealthy backer, Bjørn Rune Gjelsten, and, of course, their wives. A “family council,” it was called. This time, Solskjær was picked up in Røkke’s jet, which, like Lerner’s, had been placed so provocatively in view of the media’s assembled lenses. After the no-doubt exquisite meal, the news broke in the UK – Solskjær had turned Villa down. “Family reasons,” it was said. Lerner wasn’t mad; he understood. And so ultimately will football fans in Britain, who will forget the whole saga as soon as a new man is found for Villa. The baby-faced assassin strikes again? Solskjær returned to Molde, where a press conference with Røkke and Gjelsten was hastily arranged and handled with similar aplomb, complete with back-slapping, laughs and gushing praise following in both directions to hide the obvious power play that had just gone on. Røkke and Gjelsten will continue to back Molde privately. Solskjær has been promised more money to buy players. His stock as local hero has never been higher. 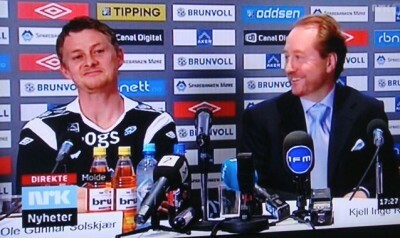 Even if Solskjær stressed that he had learned much from the drama, perhaps we can learn from Solskjær. He used subtle threats of leaving to secure a better deal, and managed to do it all without losing his respect, either in Norway or in England; he is a bigger hero than ever, the big Norwegian name who sacrificed his own ambitions for his family and Norwegian football, giving Røkke and the Molde fans everything they ever wanted, even as he toyed with everything they really had. Oh, yes – and he managed to steer Molde to two wins this week. Other than that first flying folly, you have to wonder how he could have played it better. The baby-faced assassin strikes again? You can bet on it.